The tour was well organised in terms of travel and hotels, however some aspects of the itinerary were changed compared with the trip notes and was therefore a bit disappointing to miss these things. The trip itinerary and notes i was provided with were sometimes entirely different to the actual plan. If people are considering going on holiday with a tour then I would have no hesitation to recommend intrepid. Welcome to Peru's coastal capital. Your adventure begins with a welcome meeting at 6 pm where you'll meet your tour leader and travel group. There are no other activities planned for today, but why not head out with the group after this important meeting and get to know each other better over dinner. Whether you dine with the group or sample the city's renowned food scene on your own, don't miss sampling Peru's national dish, ceviche (raw rish marinated in lime juice, often served with hot peppers). If you're not a fan of seafood, there are plenty of other excellent options on offer. Ask your tour leader for advice. If you arrive early, perhaps take a walk around the vibrant Miraflores area. Alternatively, stroll along to Parque del Amor (Love Park) for a great view of Lima's beaches. This morning, set out on a half-day walking tour of Lima's historical centre. Take in the ornate spectacle of the colonial mansions, palaces and churches that line the streets; choose to pay a visit to San Francisco Monastery and its catacombs; and browse the fresh produce on offer at Lima's central market, tasting fresh fruit and street food. Your walking tour wraps up in Lima's main square, with the rest of the day free to do as you wish. Later, perhap head out for dinner with the group. Flanked by streets of ornate mansions, palaces and churches, Plaza Mayor is the best place to start any exploration of Lima. Take a walk through the old streets to get a feel for colonial life. On one side of the plaza is the Cathedral of Lima, which houses the remains of Lima's founder, Francisco Pizarro. Nearby is the San Francisco Monastery, with its catacombs containing some 70,000 human remains (entry is optional and at travellers' expense). The afternoon is free for you to explore the city on your own. In the evening, perhaps try some ceviche for dinner. Depending on your pre-arranged travel arrangements, during the next four days you may: hike the Classic Inca Trail, hike the Inca Quarry Trail or stay in Cusco for another two days before taking the train to Aguas Calientes. While away from Cusco, the bulk of your luggage will be stored at your hotel. If you’re hiking the Inca Trail or the Inca Quarry Trail, the evening before you leave Cusco you'll receive a small duffle bag to carry your clothes in for the next four days (5 kg maximum). Your team of porters will carry these bags for you, together with the food and equipment for the trail. Please note that you won't have access to these items until the end of each day, as the porters will always be ahead of the group. If you’re travelling to Aguas Calientes by train, you'll be able to leave most of your luggage at the hotel in Cusco and only travel with the necessary items for the next few days. Route 1 Classic Inca Trail: Travel by minivan to the 82 km marker and meet your crew of local porters, cook and guide. The first day includes uphill trekking to the campsite, which is at 3100 metres above sea level. On the way you’ll see the ruins of Llactapata, which was burnt to the ground by the last Inca emperor to discourage Spanish pursuit down the trail. In the evening, set up camp while the cook makes dinner. Notes: The Inca Trail is within the abilities of most reasonably fit people, but please come prepared, as the trail is 45 km long and often steep. Each day's journey generally consists of seven hours of walking (uphill and downhill), with stops for snacks and lunch. Trekking usually begins at 7 am (except on the fourth morning) and you reach the campsite around 5 pm. Accommodation on the trek is camping (three nights). Double tents (twin-share) and foam camping mats will be provided. The porters will set up the tents while the cook prepares meals. Route 2 Inca Quarry Trail: Make an early start today and drive to Choquequilla, a small ceremonial place where Incas worshipped the moon. Drive to the starting point of the trek, Rafq'a, and meet the horsemen who join us on the hike. After an hour’s walk, reach the small community of Socma. Carry on to the Perolniyoc cascade lookout, an opportunity to stop for photos and a food break. Continue to the campsite, which is 3700 metres above sea level. You should reach the campsite around lunchtime. After lunch, set off to explore the Q'orimarca archaeological site, which once served as a checkpoint to the Incas. Notes: The Inca Quarry Trail is within the abilities of most reasonably fit people. The hike is 26 km long in total and its highest pass is at 4450 metres above sea level. Throughout the trek, horses will carry your gear and camping equipment. The first two nights are spent camping and the third night you will stay at a simple hotel. Double tents (twin-share) and foam camping mats will be provided. The porters will set up the tents while the cook prepares meals. Route 3 Train: For those travellers disinterested in hiking the trail or who are unable to, spend two extra nights in Cusco before travelling by bus to Ollantaytambo. From here take a train through the winding Urubamba Valley to the town of Aguas Calientes where you’ll spend a third night. Please note: Included lunch and dinner on this day is for people trekking the Inca or Inca Quarry Trail only. Route 1 Classic Inca Trail: This is the most challenging day of the trek, as we ascend a long steep path (approximately 5 hours) to reach the highest point of the trail. Colloquially known as 'Dead Woman's Pass', Warmiwanusca sits at a height of 4200 metres above sea level, providing amazing views of the valley below. The group will then descend to the campsite in the Pacaymayo Valley at 3650 metres. Route 2 Inca Quarry Trail: This is the most challenging and rewarding day of the hike. A three-hour walk takes us to the top of the first pass of Puccaqasa (approximately 4370 metres high). After enjoying picturesque views of the valley, it’s a short walk before stopping for lunch. Afterwards, make the hike to Kuychicassa (approximately 2 hours); this is the highest pass of the trek at 4450 metres. From here, descend to the sacred site the Incas called Intipunku (Sun Gate), with views of the Nevado Veronica mountain. Head to the campsite, which is only a stone’s throw away at Choquetacarpo. Route 3 Train: Today, perhaps use your free day indulging your inner foodie in the eateries of Cusco. Head to lunch at the arty Fallen Angel restaurant, and if you still have room for dessert, the ChocoMuseo offers tastings and chocolate-marking workshops. Please note: Included lunch and dinner on this day is for people trekking the Inca or Inca Quarry Trail only. Route 1 Classic Inca Trail: Start the day with a climb through the Pacaymayo Valley to Runkuracay pass (3980 metres). Enjoy views of the snow-capped mountain of Cordillera Vilcabamba before descending (approximately 2–3 hours) to the ruins of Sayacmarca. Continue over the trail’s third pass to the ruins of Phuyupatamarca (3850 metres), also known as 'Town Above the Clouds'. Start the descent down the Inca steps (approximately 2 hours), which takes you to the final night's campsite by the Winay Wayna archaeological site. Route 2 Inca Quarry Trail: Today’s hike will all be downhill. The first stop is the incomplete Kachiqata quarry, where the Incas were intercepted by the Spanish. Around midday, come to the end of the trek. Explore the cobbled streets of Ollantaytambo before taking the short train journey to Aguas Calientes. This is where you’ll meet up with the travellers in your group who didn't hike. Spend the night in a comfortable hotel before tomorrow’s visit to Machu Picchu. Route 3 Train: In the morning take the train to the town of Aguas Calientes (approximately 3 hours), which is nestled in the hills at the foot of Machu Picchu. For those who want to, there’s time to visit Machu Picchu independently before the guided tour the next day. If you’d like to do this, please advise your group leader at the welcome meeting at the start of the trip. Please note: Included lunch and dinner on this day is for people trekking the Inca or Inca Quarry Trail only. Route 1 Classic Inca Trail: The day starts before dawn with breakfast at 4 am. Say farewell to the porters as they descend to the train station and then begin hiking by 4.30 am (the final checkpoint opens at 5 am). The walk to Intipunku (the Sun Gate) takes approximately 2.5 hours meaning arrival time is not until approximately 7.30 am. Weather permitting, enjoy unforgettable views over the ‘Lost City of the Incas’ as you enter Machu Picchu through the Sungate. Route 2 Inca Quarry Trail: Depending on weather conditions, take a bus at 5.30 am along the winding road to Machu Picchu (30 minutes). 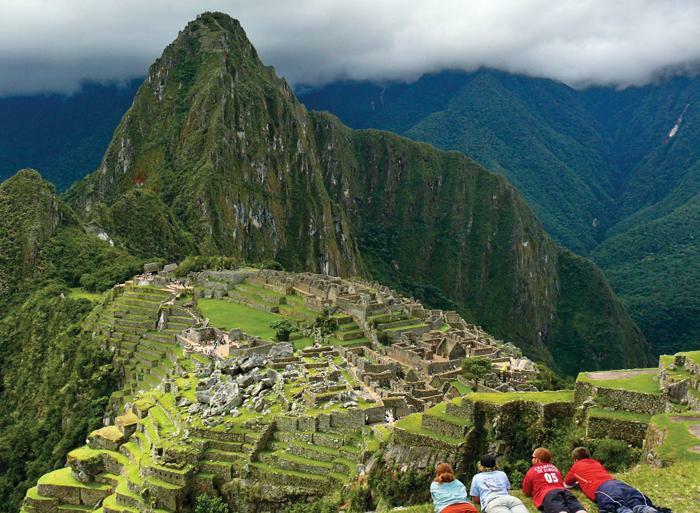 At Machu Picchu, join up with the travellers in your group who took the train. If skies are clear, enjoy a spectacular views over the ancient city from the Sun Gate, before going on a guided walk around the ruins. Route 3 Train: In the morning, usually between 5.30 and 6.30 am, we take one of the first buses up to Machu Picchu. The city was built around 1440 AD as a country retreat for Inca nobility, but there’s evidence that the land had been a sacred Incan site for much longer. Take a guided tour around the ruins of temples, palaces and living quarters, and enjoy some free time afterwards to wander around on your own before heading to Ollantaytambo for the night. Visiting Machu Picchu: According to Machu Picchu visiting regulations, all visitors must follow a pre-determined route within the site. This route must be followed in one direction only and once the guided visit commences exiting and re-entering the site is not permitted. Once the guided visit concludes, visitors must exit the site and personal exploration of Machu Picchu is not permitted.